Physical characteristics: The red-legged seriema has, as its name suggests, red legs. It also has a red bill. The eyes are yellow and surrounded by a patch of featherless blue skin. The tip of the tail is white in color. The feathers are generally brownish on the back and pale on the belly. The red-legged seriema also has a 3- to 4-inch (7- to 10-centimeter) crest of stiffened feathers on top of its head. Males and females are generally similar in appearance, although the males are slightly larger than the females. Juvenile seriemas have black bills rather than red ones. Geographic range: The red-legged seriema is found in central and eastern Brazil as well as portions of Paraguay, Bolivia, Uruguay, and northeastern Argentina. Habitat: The red-legged seriema inhabits grassland habitats, as well as open scrub or brushland areas and the edges of wooded forests. Diet: Red-legged seriemas forage, or hunt for food, in pairs or small groups. They have a diverse diet including animals such as insects, worms, small mammals, frogs, snakes, and lizards, as well as fruit and other plant material. Red-legged seriemas will also eat either the eggs or chicks of other bird species. Some prey are smashed against rocks to make them easier to swallow whole. Behavior and reproduction: The red-legged seriema spends much of its time on the ground. It rarely flies but prefers to run away from danger. However, they do roost, or spend the night, in trees. Red-legged seriemas sunbathe—they lie on the ground on their sides and appear, sometimes, to be dead. Red-legged seriemas have very loud calls that can be heard as far as a mile away. The call is described as sounding like the yelp of a dog. Calling generally occurs in the morning, as a male and female pair cry out to each other. The purpose of the calling is to defend their territory from other members of the same species. Red-legged seriemas are monogamous, that is, a single male mates with a single female. They build their nests as high as 10 feet (3 meters) off the ground, usually in a tree. Nest building is a long process for this species, taking up to a month. Both the male and female participate in nest building. Before mating, males show off their feathers by extending their wings. They also strut, walking around with their heads down and their crest of feathers up. The female red-legged seriema lays two eggs at a time. 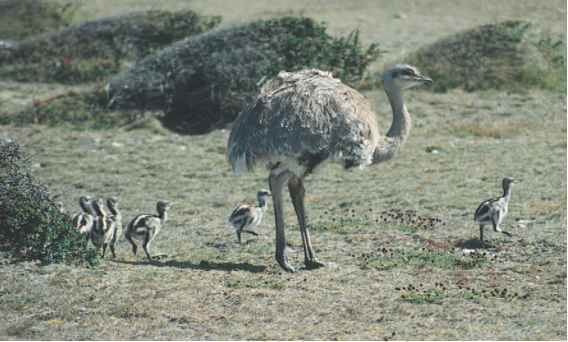 Both parents help incubate, or sit on, the eggs, which hatch after twenty-five to twenty-eight days. Chicks are able to fly after approximately one month. Red-legged seriemas and people: Humans sometimes use red-legged seriemas in their chicken coops, because they will give an alarm cry if predators approach. Red-legged seriemas are also hunted for their meat. "Cariamidae (Seriemas)." The Internet Bird Collection. http:// www.hbw.com/ibc/phtml/familia.phtml?idFamilia=50 (accessed on April 12, 2004). "Family Cariamidae (Seriema)." Animal Diversity Web. http:// animaldiversity.ummz.umich.edu/site/accounts/classification/Cariamidae. html#Cariamidae (accessed on April 12, 2004). "Seriemas." Bird Families of the World, Cornell University. http://www. es.cornell.edu/winkler/botw/cariamidae.html (accessed on April 12, 2004).